Few days in Malcolm Little’s imprisonment ever made him smile. He inhabited a caged world where sinners outnumber saviors and hell is a lot closer than heaven. But on April 15, 1947, a grin eased across his face as he listened to the radio. Little, still years away from dropping that “slave name” and replacing it with “X,” wed himself to the radio to hear Jackie Robinson become the first African-American to break Major League Baseball’s color barrier. Little understood what was at stake. If Robinson succeeded on the field, he would shatter the ugly stereotypes about black-male inferiority. Carrying the burden of his race also meant that, if he failed, it would set back the freedom movement. But just hearing the announcer call Robinson’s name was enough to fill Little with pride, calling himself, then, Robinson’s most “fanatic fan” in The Autobiography of Malcolm X. You only do two days in the joint: the day you go in and the day you get out. In 1947, Little passed the time acting as Robinson’s unofficial statistician, figuring out his batting average after every game. He was in the second year of an eight-to-10 year sentence for burglary. Less than a year later, he was transferred to Concord Prison, where his brother, Philbert, persuaded him to join the Nation of Islam, a decision that would make him the most controversial black man in America years later. 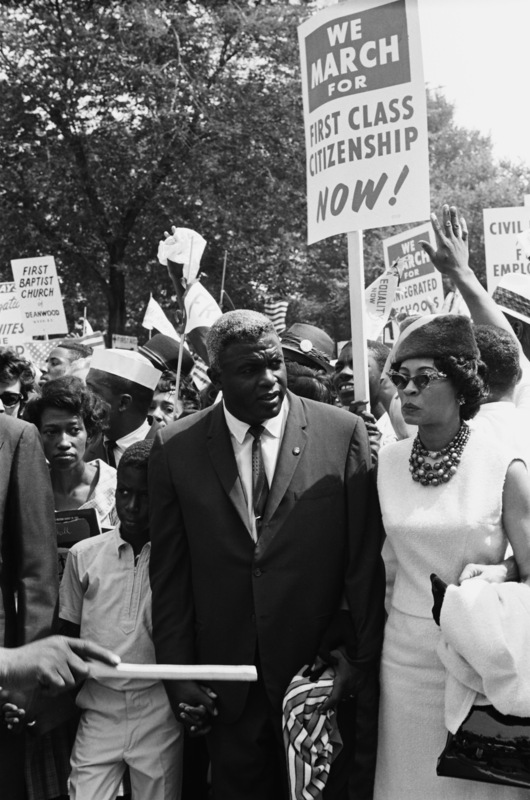 In many ways, when Robinson integrated the MLB, it placed him at the forefront of the modern civil rights movement. There was still work to be done, as not every team was as open as the Brooklyn Dodgers to diversifying its clubhouse to men who looked like Robinson. But peering into the stands in National League ballparks across the country, Robinson saw black faces in the same section as white faces. For black folks, going to see Robinson play baseball was an event. 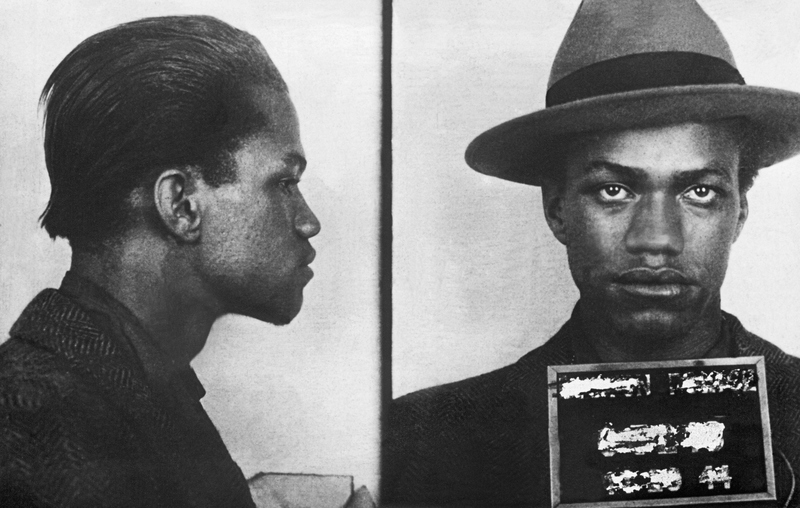 1944-Boston, MA: Malcolm Little, at age 18, at the time of an arrest for larceny, police photograph front and profile. From Charlestown State Prison in Boston, Little grasped the magnitude of the moment. Robinson forced white people to re-examine their attitudes about race and segregation in America. He helped pave the way for a movement that would accept nothing short of equality. What Little admired most about Robinson in 1947 was that he was a black man who possessed the kind of courage that inspired African-Americans to fearlessly stand up against injustice. But by 1963, nine years after Little left prison, Robinson was anything but a hero to him. Now named Malcolm X, and a minister in the Nation of Islam since 1953, he preached black nationalism. Many in the black community respected Malcolm X, who they felt spoke the brutal truth about race in America. He gallantly condemned white supremacists and never cowered. But he was also known as a fiery demagogue who called whites “devils” and, infamously in 1962, asserted that a “blessing from God” caused Air France Flight 007 to crash and kill 120 white passengers. In his mind, Allah delivered retribution for the white man’s crimes against the black man. This earned him worldwide acclaim for all the wrong reasons. And as the second most powerful man in the Nation of Islam — a group viewed by many as a terrorist organization — he drew venomous criticism from black and white detractors. For much of 1963 and into 1964, Robinson was one of Malcolm X’s most vocal critics and vice versa. Historically, and notably in recent years, dueling schools of thought — occasionally headlined by prominent athletes — have butted heads in very public forums (a la former Baltimore Raven Ray Lewis and Black Lives Matter). Robinson and Malcolm X fought for the same end goal of black liberation and equality. The root of their issues with each other stemmed from conflicting viewpoints of how to get there. Robinson was a proponent of integration and an avid supporter of Martin Luther King Jr.’s nonviolent approach, though he claimed in a July 1963 column in The Chicago Defender, he was not and didn’t know “how I could ever be nonviolent.” Malcolm X, on the other hand, believed black people should live separately from their white counterparts. Segregation, he argued, reduced black people to second-class citizenship. But separatism was a choice black nationalists used to assert their political and economic independence. To Robinson, Malcolm X and the Nation of Islam were serious threats to the goals of the civil rights movement. On April 6, 1963, Robinson published a column in the New Journal and Guide — a weekly African-American news journal that, like outlets such as The Chicago Defender, was a megaphone of the civil rights movement — calling out revered Congressman Adam Clayton Powell for suggesting that black people boycott the NAACP and support Malcolm X and the Nation of Islam. Of the minister, Robinson expressed his respect, but hammered home the notion that black Muslims were not the true solution to the black man’s problem. Malcolm X responded a month later in Washington, D.C., when he told reporters that King’s actions were dictated by white liberals who helped fund his nonviolent movement, as reported by the New York Amsterdam News in May 1963. Rumors swirled that Malcolm X would visit Birmingham, Alabama, after the Ku Klux Klan bombed King’s organizing headquarters, but Malcolm X’s superior, the Honorable Elijah Muhammad, ordered him to refrain from retaliation, a recurring theme in their relationship. Malcolm X criticized those who traveled to Birmingham to support King after the bombing, such as Robinson and boxer Floyd Patterson. Their trip to the ravaged southern city, he said, was nothing more than pawns being manipulated by white liberals trying to assuage a justifiably angry community. In his July 1963 column in The Chicago Defender, Robinson flipped the script. 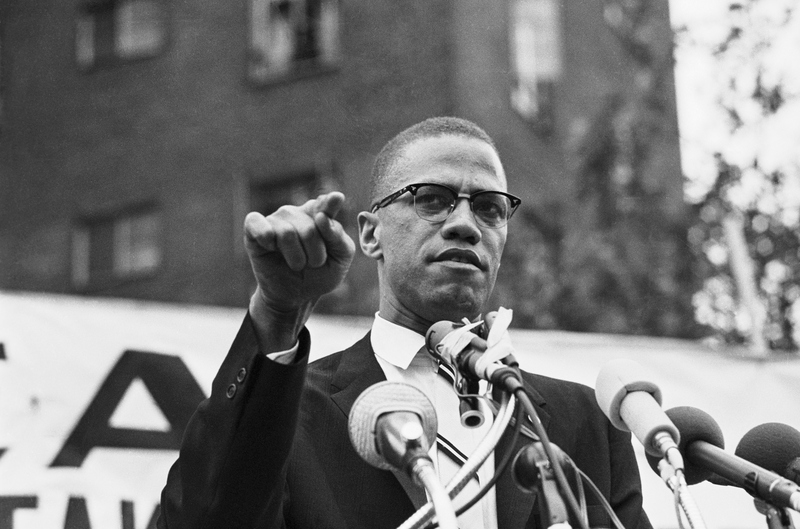 He demanded Malcolm X and the Nation of Islam to accept responsibility for an egging incident on King in Harlem, New York, an act Malcolm X all but ordered. He also questioned whether the Nation of Islam received funds from outside the race. Nation of Islam leader Malcolm X draws various reactions from the audience as he restates his theme of complete separation of whites and African Americans. The rally outdrew a Mississippi-Alabama Southern Relief Committee civil rights event six blocks away 10 to 1. “Could it be that individuals or groups, which believe in segregation, find the Muslim version of segregation-separation useful to their cause?” he asked. Although Robinson didn’t mention any names, he was likely referencing a public 1961 Nation of Islam rally attended by members of the American Nazi Party and its founder George Lincoln Rockwell (the Nazis were reportedly outnumbered 800-1). Malcolm X had accused Robinson of shucking and jiving. Robinson accused Malcolm X and the Nation of Islam of leading black America down a path of surefire destruction. But the war of words would only become more personal. Civil rights leader Medgar Evers was assassinated in his driveway on June 12, 1963, in Jackson, Mississippi. Byron De La Beckwith, his killer, couldn’t even look him in the eye as he shot the civil rights leader in the back with a rifle. Evers would be the first in a series of leaders to meet extremely violent deaths in the fight for equality. Malcolm X did not attend Evers’ funeral. Robinson would use this as fuel for a Nov. 16 column in The Chicago Defender. Months of frustration and paranoia had finally boiled over for Malcolm X. The same day his anti-Robinson column hit papers, so did news of his suspension from the Nation of Islam for controversial remarks — “chickens coming home to roost” — following President John F. Kennedy’s assassination. The former Brooklyn Dodger defended himself eloquently in a column a week later in The Chicago Defender. Robinson denounced Malcolm X as a racist. “Those of us who are so committed have no intention of supporting the idea of a separate black state where the Honorable Muhammad can be the ruler and you, his immediate successor — and all because you, Malcolm, hate white people,” Robinson wrote in that same Dec. 14, 1963, column. Blasting Malcolm X was one thing. Mentioning Muhammad — the supreme minister in the Nation of Islam and unquestioned leader — immediately meant Robinson’s words had run its course in the Nation of Islam. Speaking ill of him could come with heavy consequences. As such, according to Blood Brothers, at the height of their feud in 1963-64, tensions nearly escalated to physical violence. A supposed plot to harm Robinson was put in motion following an editorial that spoke of Muhammad in an unfavorable light. The only problem was that the group of black Muslims confused Jackie Robinson for Sugar Ray Robinson. Muhammad preached that sports were a distraction for black people. The group reportedly went to his house, but the boxing great was not home and the plan was abandoned. Malcolm X and Robinson’s beef represented two rival, but very real viewpoints in African-American culture in the mid-1960s. Three months after the Clay and Robinson comments, Malcolm X, now completely removed from the Nation of Islam, embarked on his pilgrimage to Mecca. The trip forever changed his worldview. He found spiritual wholeness for the first time in his life. Gone were the beliefs of white people as exclusively evil. He saw Muslims with “blonde hair and blue eyes” practicing the same faith. His calls for a separate black state vanished, too. Many Americans, including Robinson, were astonished by this new Malcolm X. Was he for real in wanting to cooperate with civil rights leaders, many of whom he berated only months earlier? What was his endgame? In his rise to national prominence and controversy, Malcolm X won a legion of followers, particularly young people who adored his audacious attitude. But at this time in his life, the hate surrounding his name perhaps outweighed the love. Robinson was half-right. For the second time in his life, Malcolm X was reformed in his thinking. He was genuine and no longer indoctrinated by Muhammad’s teachings. This was not the same man who mercilessly blasted him in a column less than a year ago. But the ballplayer-turned-activist-and-columnist had a point. Pre-Mecca Malcolm X offended many African-American leaders who, in truth, could help promote his new line of thinking and his Organization of Afro-American Unity he desperately needed to get off the ground. Robinson was playing golf when news of Malcolm X’s assassination reached the warm weather of Miami on Feb. 21, 1965. Despite their fallout, the impact of Malcolm X’s murder hit Robinson quite hard. Robinson later referred to the assassination as a “tragedy of the first order” in his autobiography. Trying to change tomorrow, as the 1960s taught repeatedly, came with a sacrifice. Had Robinson and Malcolm X had one more chance to speak, perhaps history would be different. Maybe they could have found middle ground. Maybe they could have apologized for how things spiraled out of control so quickly and publicly. Or maybe, most importantly, they both could have seen in each other what Malcolm X saw in Robinson from his prison cell two decades earlier. They were, after all, two freedom fighters.